I was in Nashville for work last week. I was there for only one night and stayed at the “new” Aloft Hotel. I am attempting to gain status at Starwood and moving (again) away from Marriott. Our meetings in Nashville were across the street from this hotel (Google Maps showed that we were 153 feet from our meeting site), so the location for us was perfect. I always check TripAdvisor for reviews before I book any hotel. Unfortunately, I couldn’t find any reviews of this hotel. Further checking revealed that this Aloft was new — a few weeks earlier the hotel changed from an Indigo Hotel. The change over took place about 2 weeks before I arrived and nothing really had changed other than both exterior and interior signage and couple of branded items in the rooms. I did not find anything that said Indigo Hotel though. Before I left for the airport to fly to Nashville I checked TripAdvisor again and was shocked at the reviews. So many people hated this hotel. TripAdvisor had changed the name of the hotel from the Indigo to the Aloft and all the old (and some new) reviews followed. 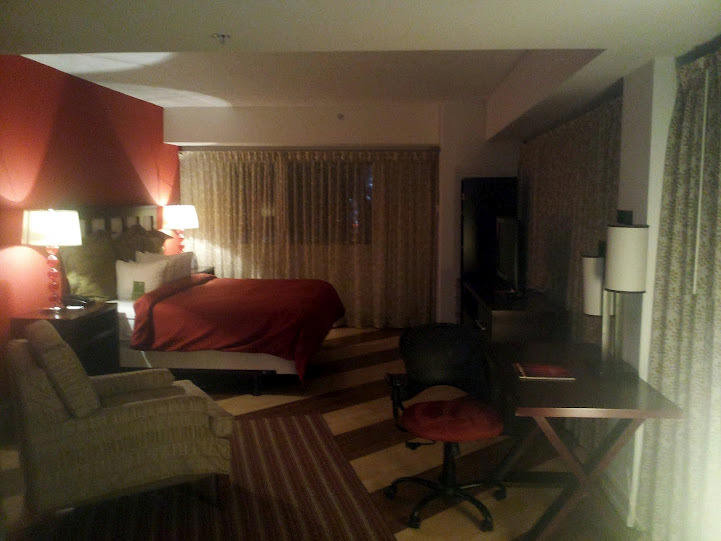 I left Chicago feeling a big sense of regret about booking this hotel and it was too late to cancel without a charge. We arrived at the hotel around 21h00 and found the woman working the front desk on the phone helping another customer. She chatted for about 5 minutes on the phone, answering questions about the hotel change over and reassuring the future guest that the hotel will be much better than it was on her last stay. I was greeted and felt really welcomed by this woman. She let me know that wifi was free throughout the property and that breakfast was served between 06h30 and 11h00. She actually said “Breakfast is served between 6:30am and 11:30am every day…in the morning”. Well, duh, breakfast is usually served in the morning and the suffix of “a.m.” also indicates morning. As my southern grandma would say “Bless her heart”. We walked around the corner and found several large elevators that easily held a few guests and luggage. I was assigned a room on the 7th floor (Room 701 to be exact). The halls were very wide and had several public sitting areas (who uses these areas in the hallways, really?). I entered the door and found a huge room, with a zebra striped pergo floor. I like the floor design, but wouldn’t have it in my house. The room had a small desk and a chair plus a club chair facing the TV. 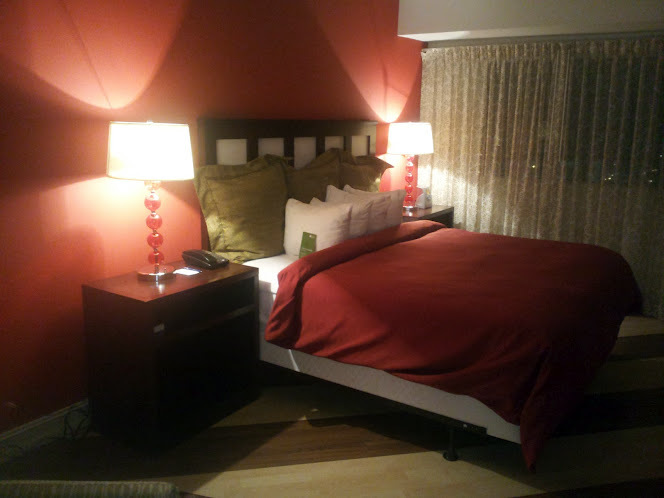 The king size bed was so comfortable too. The walls were brightly painted – definitely having a young/trendy vibe. The walls were dinged and scuffed quite a bit. I was in a corner room with a ton of windows. I was a bit frustrated by having to close ALL these curtains before bed, but it was nice to have all this natural light while I got ready in the morning. The TripAdvisor reviews slammed the bathroom. 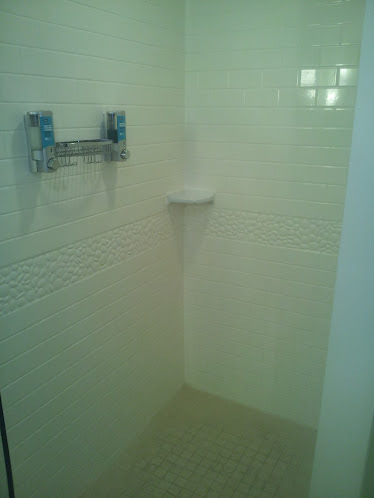 The shower doesn’t have a door so other reviewers complained about water slopping all over the floor. I didn’t have this issue. Bathing like a normal person and not an elephant in the lagoon should keep the bathroom floor dry. The water pressure was great and the hot water was consistent. There was no fan in the bathroom though, so it did get a bit steamy. 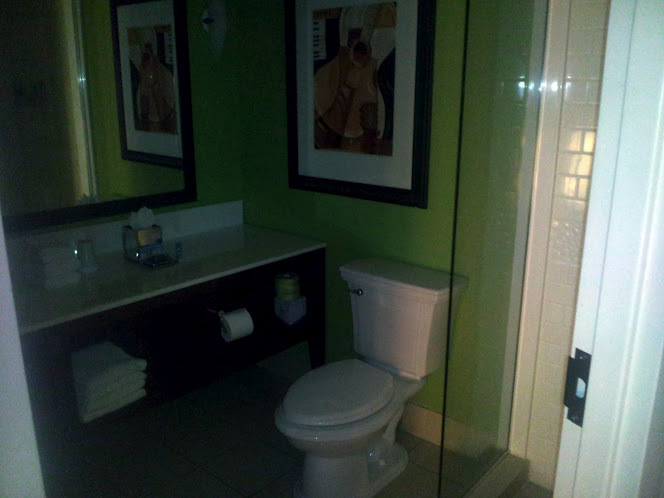 The bathroom doors were louvered too, which doesn’t really provide bathroom privacy if traveling with others. 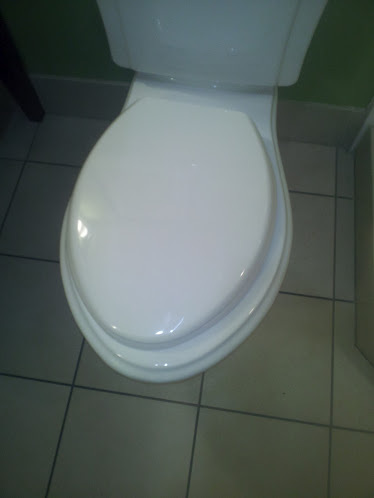 The strangest thing about the bathroom – the toilet seat was too small for the toilet. I just don’t get it. It wasn’t loose, but it just felt like it was a shoddy repair — but according to the other folks I traveled with, they had the same wrongly sized toilet seat. A design choice or a purchasing error when the hotel was built? I don’t know, but it looked off. Would I stay in this hotel again? Yes, I would. It wasn’t amazing, or glamorous. 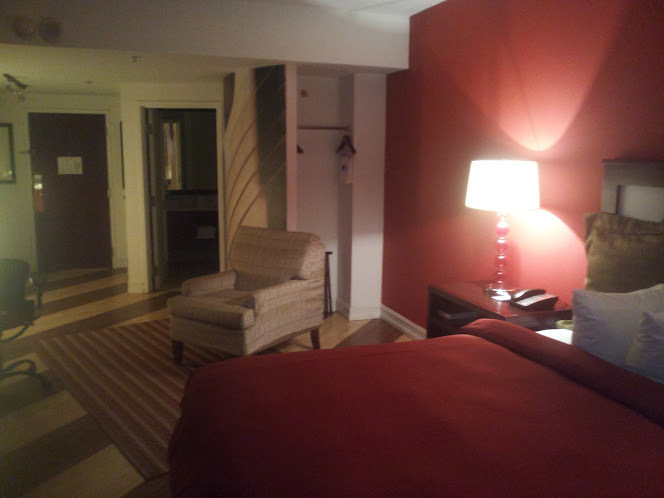 It was a little rough and dated (warn carpeting, cheap pergo floors and dents/scuffs on the walls), but the service was really good for a lower end hotel and the wifi was free and fast. There are a ton of other mid to low end hotels in this area (Embassy Suites, Courtyard Marriott, Aloft, Hampton Inn, Hilton Garden Inn and Home2 Suites were all within quarter of a mile). I wouldn’t hesitate staying here in the future. My biggest complaint? The number of power outlets in the room. The desk didn’t have a single outlet nearby and all the outlets near the bed were taken. I had to unplug one of the lights on the nightstand and the telephone just to plug in my gear. C’mon hoteliers — we need outlets! Where do you stay while in Nashville? Do you drive or rely on taxis while in the City? Do you stick to national chains or find a local gem? By Tim in Travel on October 2, 2012 .